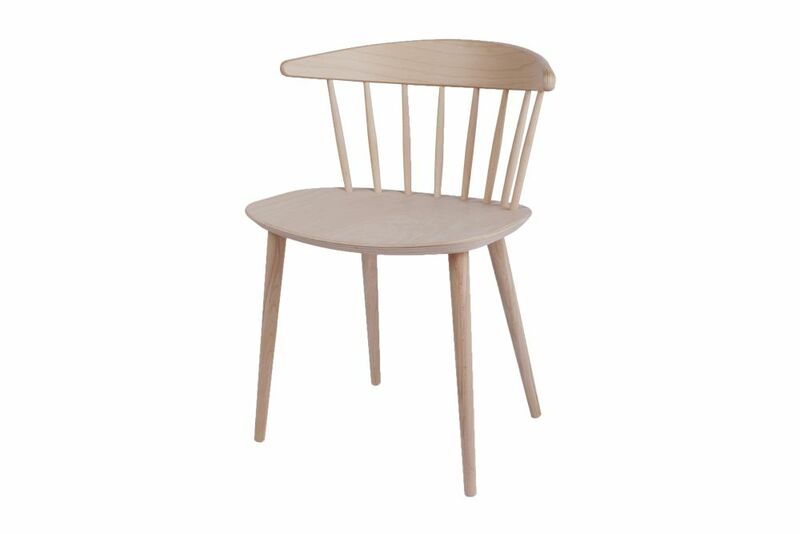 J104 dining chair is part of HAY's 2011 relaunch of the Danish furniture classics originally made for FDB (The Danish Consumers’Co-operative Society). With its wide back and seat combined with the light, vertical graphic expression, J104 resembles a cross between a dining chair and a lounge chair. In this unique composition, although the broad seat takes up visual space, the slat structure of the back lightens the overall impression and makes J104 a natural-born sculptural classic. The J104 chair has a natural soaped finish and is not lacquered, hence unlike the lacquered finish, is more susceptible to marking and natural staining. Clean with a clean cloth wrung in water or in a solution of water and a neutral detergent or soap flakes. Remove soap residue immediately using a clean, dry cloth. To remove stains, clean and scrub using a thick solution of soap flakes that is not allowed to stay on the wood for more than 2 minutes. Then remove the remaining soap residue using a damp cloth. If the grain of the wood rises after cleaning, gently sand down the wood using fine-grit sandpaper (No. 220), always going with the grain. If the surface is scratched or appears matt, use a care product suited especially for soaped wood. Jorgen Baekmark is a Danish designer who worked at the FDB furniture design studio from 1958 until 1967. He trained as a cabinet maker and took courses in the applied arts, he is known for a particular lightness of touch and for pioneering flat-pack furniture for export. FDB (Fællesforeningen for Danmarks Brugsforeninger) is the Danish Consumers Cooperative Society, more widely known as Coop. The FDB furniture department played a pivotal role in revolutionising the industry in Denmark, it was founded in 1933 and in 1942 Børge Mogensen was installed as design director. His pioneering approach was distinguished by a desire to create simple, elegant and practical design intended for mass consumption. At FDB, Baekmark was initially tasked with designing lightweight pieces for export, such as the JW08 chair, and later went on to become the head of FDB furniture department himself. His designs now produced by HAY are the J104 chair and the C44 table.